This top was finished a while ago now. The really pretty fabric that was the inspiration for this top came to me in small pieces. I had only a few inches wide but 12-14" long. I had to come up with a pattern that would show off the beautiful fabric to its best. I thought of this design, which of course, is a classic pattern and made it up. It is simple, quick and effective. the colors are beautiful. This is very light gray, not white, in the background. I quilted it with an all over stippling - even while doing it wondering if I should have tried some more swirls. And the answer is "yes", I should have. 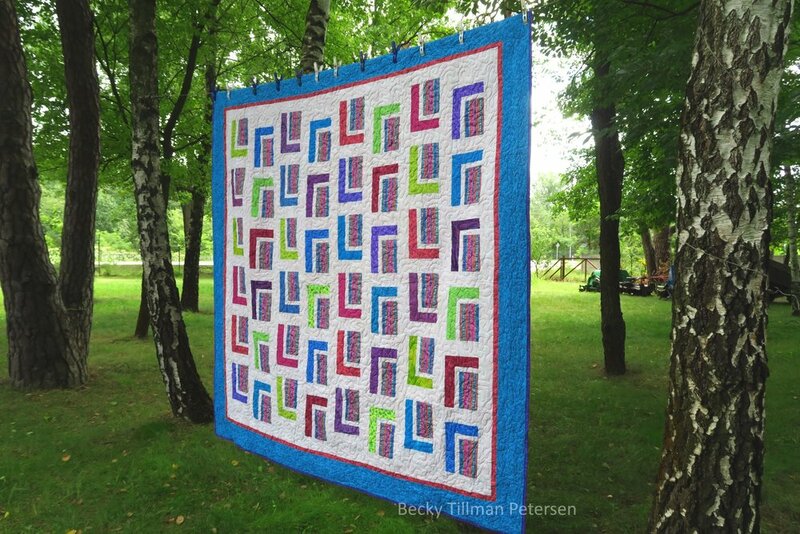 I think it would have elevated this fun, but simple quilt to extra nice. But I didn't. It's done now and that is wonderful. Count it off the"to do" list. The pattern has been updated and is on the free patterns page. 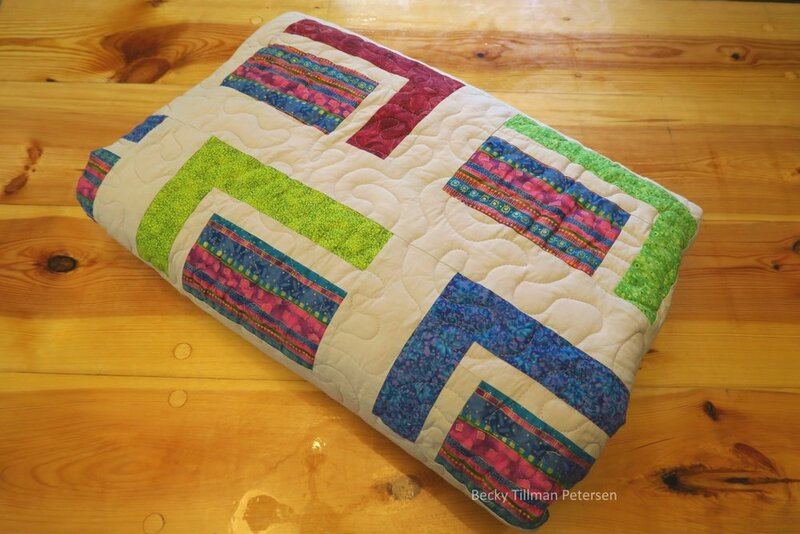 As usual, I like to post a quilt roll. Here maybe you can see the beautiful colors of the main fabric. It's a very easy block. If you are in a hurry to make a quilt - which in the end will have a 'modern' feel to it, go with something like this pattern. I also made this particular pattern up for my daughter in law, who is a Nebraska Huskers fan - here's hers in a different color scheme, and also quite a bit smaller. And so you have it - a simple design! I hope someone can use it! Very nice fabric. Perfect for quilting. Perfect for a themed quilt. Really neat cowboy print in stripe pattern. Horses, cowboy boots and more.